Nadine Charlsen can be found every day in her studio space at 310 ART creating large scale watercolors. Her newest piece up on an easel, she is surrounded by framed works and carefully organized large files of paintings sorted by countries. While she does create some smaller pieces, none are your usual watercolor paintings. In fact, most viewers and even experienced collectors do not recognize this work as watercolor. With bold and striking lights and darks, layers, glazing, distressing, scraping, and splattering, she transforms her subjects into dramatic large-scale works that are collected as major focal points in homes and businesses. Charlsen’s background as a theater professional contributes to her feel for drama. You can often find her at her easel working with the painting upright, brush in one hand and spray water bottle in the other. Just when most would think the work is finished, she wets the surface with water and washes of paint nearly obscuring the image. Then she reconstructs and brings out the luminous light with methods that seem almost magical. And, rather than keeping these techniques all to herself, she enjoys teaching and mentoring an ever-growing number of both aspiring and experienced painters at the school at 310 ART. This February and March, Charlsen will have a featured exhibit showcasing her large pieces. Her show is cleverly titled ”Atypical Dimensions: voLUMINOUS Watercolors”. She explains, “My watercolors are not your typical small detailed 8x10 light, smooth paintings. I paint large rough gritty images of cities, landscapes, industrial sites that have texture and depth. The watercolors that I will show in the voLuminous Dimensions show are much larger than "grandma's watercolors". Besides her years as a theater professional in NYC, Charlsen has traveled to many countries taking thousands of photos. When she began her recent Train Series, she found dozens of train photos taken over the years. Long before she moved permanently to Asheville and the River Arts District to work, she had complied many photos of the district on visits. “Now some of my paintings are of buildings no longer in existence in the RAD. It is a historical record, besides being a collection of painting resources for me. Where to go: The show runs from Feb 2 to April 2 with an opening reception Feb 3 from 1:30 to 4:30. (snow dates are Feb 10 or 16). An art talk and closing reception will be held March 29th, 2:00-6:30. 310 ART, Riverview Station ground floor N, 191 Lyman St, #310, Asheville, NC 28801. 310art.com. opened 7 days a week, Feb 12-4, March 11-5. I used to love printmaking when I was in college in Colorado – the big presses exerting 1500 pounds per inch of pressure, the smell of the inks, and the ability to reproduce multiple copies of single hand-created image. I loved cutting the images up and recombining them. I carved wood blocks, I made etchings, I did monotypes - but the cost of the press and the highly technical nature of printmaking meant that I didn’t do it much in those first few years after college. But the idea of reproducing an image stuck with me, as did creating an indirect image by inking a surface or capturing a texture. 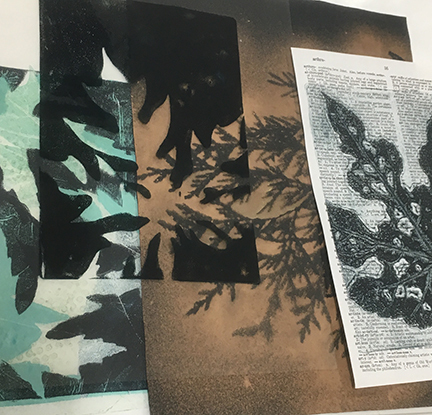 I played with photocopies, collage, and what I called “junk printing” – pulling a print from inked up bits of foam, string, or other found objects. Something else stuck with me from college and my time in Colorado. I had a love of hiking and the natural world! I tried using photographs and found natural objects in my work, but it never quite clicked. 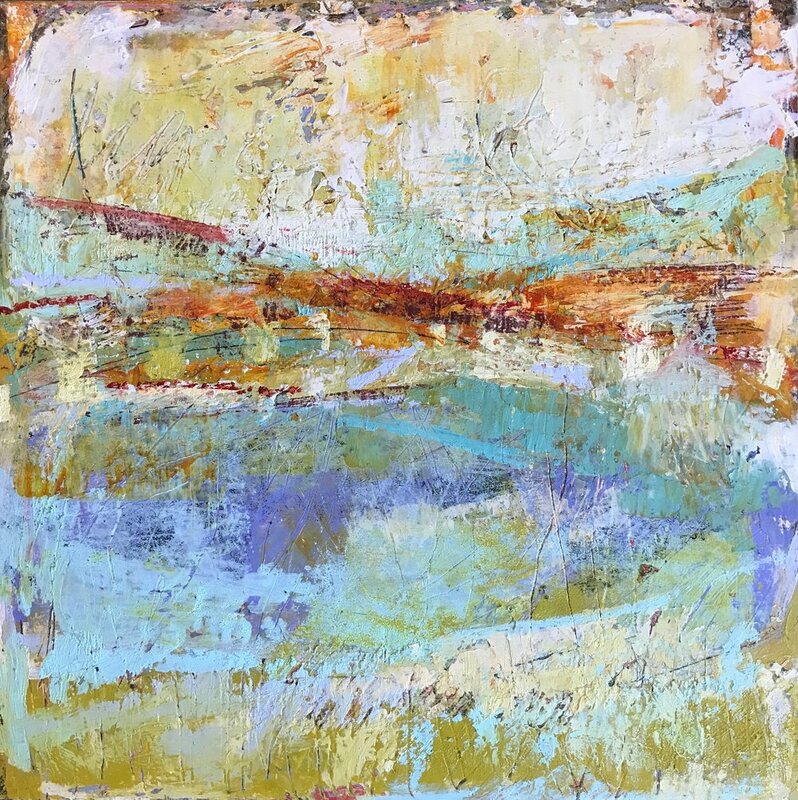 The closest I came was color – even now, the colors in my work are strongly influenced by the turquoise skies, rusty red rock formations, citrus green lichens, and bold yellow-orange aspen leaves of Colorado and the Southwestern United States. In 2010, I was invited to teach encaustic to members of the Nature Printing Society, then having their annual workshop on the Oregon Coast. Encaustic is my primary medium – a combination of molten beeswax, resin, and pigments that is used as a painting and collage medium. I experimented a bit with pressing leaves into the surface of the warm wax to get an impression – a technique I adapted from existing methods of creating texture in the encaustic surface. For the past seven years, I’ve gone back to that annual workshop – sometimes to teach, but always to learn. My work now includes a variety of different nature printing techniques. Nature printing as we know it first emerged in the middle ages as a way of recording and identifying medicinal plants. The plants were inked or painted and then pressed onto paper, leaving behind an image. This perfectly proportioned imprint could then be colored or annotated to provide additional information. Now, I’m not only pressing the plants into encaustic, but also using their natural tannins to create designs on paper and silk ( called Eco Printing) and printing them with watercolors and inks on a variety of papers. I’ve even experimented with printing on raku-fired pottery and precious metal clay! Much of my work has to do with belonging, memory, and a sense of home. Whether the nature prints I do stand alone, or are incorporated into a larger, more complex painting, these natural elements ground the work. The plant impressions are a kind of memory and their inclusion adds a sense of place. And Western North Carolina offers a wealth of materials! Abstract art was a revolution in modern art and is thriving and evolving even today. Living with abstract art has benefits that may seem mysterious to some, but are now widely discussed and pondered upon. Eric Kandel, a Nobel prize winning neuroscientist, has even written a book that discusses the mental stimulation that abstract or minimal art can induce. He calls this “top down thinking” and it can improve and enhance our mental capacity as well as our peace of mind. In this age of self-improvement, it is surprising that we do not focus on what is on the walls of our home and places of business. By choosing abstract art we both exercise and calm our brains and emotions. Abstract artists know all about this through their practice of creating art. The artist is usually on a mission to share the special life enhancing qualities living with abstract art brings to the individual whether they understand the brain science of it or not. Kandel says that abstract art allows us to distill and simplify the many visual complexities we encounter every moment. While realistic art allows us to identify and categorize much in the way we navigate the real world, with abstraction we are challenged to formulate our own interpretations. It can be daunting at first to look at basic shapes, colors, textures and shades and create our own imaginings of what it might be and mean. But, it is also stimulating and meditative. These basics forms are clues to lead the viewer down their own imaginative path. The days are getting shorter as I write this, but soon, before we can even fret too much about early sunsets, that day arrives when the sun begins to make its way back to our side of the globe. The coming of longer days and more sunlight is a gift we all relish each early winter, making this a time of appreciation. Our various holidays at this time of year are also filled with a feeling of anticipation, magic, and thankfulness and light. Added to the aura of the season are twinkling lights, candles casting a hushed glow across the tables, bonfires and Yule logs, delicious foods and special days that mark our own personal and family traditions. The lights we display inside and out seem to beckon the sun to return to us. There is something so special about finding or making that thoughtful and meaningful gift for loved ones. It is a custom in most traditions to celebrate our gratitude with the act of giving. While children eagerly await the surprises of gelt-giving, the last day of Kwanzaa, the arrival of Santa, the Winter Solstice time and other times of gift giving traditions, the older folks seem to enjoy giving more than receiving. There is a restful balance to the give and take, and charity abounds. The essence of the meaning of charity is goodwill and a love of humanity. What better way to show our love than by giving tokens to mark the season as we acknowledge the dark time of the year, and the arrival of longer days. Inside we kindle the lights of creativity too with handcrafted gifts made by ourselves or artisans who take delight in using their hands to create gifts of art. Often the way artists have come to their own special arts and crafts is a gift itself. We would love to hear your special story of how the gift of creativity has touched your life! A rainy day during a plein air workshop on Long Island several years ago became a day of studying green paint. The instructor said, "Make as many greens as you can with colors you have". I produced the green chart (pictured below) with the color mixtures listed below each test strip. Then I cut out the center of each strip. If you hold it up to the green trees or fabrics or nature object, you can see what colors to use in creating the color. I also have a palette of those colors to make the greens. This way the greens do not mix in with other colors on my separate warm and cool palettes. The only green watercolor I buy is Winsor Green. I use it for the green is stop lights. One tube lasts forever. This article was written by Nadine Charlsen, 310 ART resident artist. Check her page on the 310 website and her personal website for information and examples of her work. Once I did a talk on how I would jury work from submissions to a show that received over 500 entries! My job was to discourse or critique each work entered. We reviewed pieces one by one in a slide show. (We did not get through the 500 pieces needless to say!) It was noticeable that some subjects were very popular. Waterfalls, mountain vistas, scenes with barns abounded! Since the show was not themed around any of these subjects, it made the competition even more stiff for some who chose these common subjects. For artists, the most important thing to do is to enter their best work, and let each entry compliment the other. It lets the juror see that the artist has a focus, and it may be more likely that at least one of your pieces is accepted. Don’t second guess yourself, and don’t try to please the juror whatever you do! If the theme of a show is not something your work fits into, wait for the show that does. For the viewer of an exhibition, looking at the show as a whole, how it is displayed (usually this is done by members of the organization) and puzzling over how winners are chosen is a way to learn more about art. Picking the winners is a very daunting task. I think all experienced jurors work in a similar manner. I usually scan the room and see what works really jump out. I like to stand back to do this, so I view the works both close up and from a distance. In the end there are several criteria where an artist must excel to make it to the winners circle. Mastery of medium is an important one, and it is usually obvious if someone is lacking skills with their materials. A sound composition is also vitally important. Does the work tell a story or convey a feeling or mood? Sometimes a strong message can overcome weaknesses in other areas. Finally, is the work unique or does it have a flavor all its own? I am drawn to something that stands out with a compelling and creative twist. Does the artist have a different take on subject matter, or a new way of using media? While there are very clear components to a good artwork, in the end it is the subjective choice of the juror. Artists should never feel slighted. I knew an artist whose work was consistently rejected for two years. The same pieces were later accepted into a show, and he won first prize! The courage and tenacity it requires to be an artist is its own reward, and the prize is a life filled with happiness and satisfaction. All successful artists savor the process over what comes after a piece is finished. I will never forget my first art show. I was a young painter taking classes at the local community college. At the end of the semester of my first college painting class, my instructor held an exhibition for students. I do recall my eager anticipation and hours spent preparing. I had painted two pieces in an abstract genre. My classmates were not overly complimentary of my style. At that time photo realism was in vogue and abstraction was still receiving some skeptical judgments even though it had been around a while. My wonderful teacher was encouraging even though he could paint anything so realistically it jumped off the canvas. I later figured out that he was trained using a variation of the curriculum of the great teacher Joseph Albers, a German artist and Professor who fled the Nazis to Black Mountain College. It was great to have this experience as my first college painting class and I have used many of the lessons in my own teaching through the years. My instructor was a firm believer that all aspiring painters should do everything, from constructing stretchers that supported canvases from scratch to building frames. I spent an evening making 2 frames with a miter box and picture frame molding. What a job! I was excited and apprehensive at the same time. No prizes were given at this student show, but my two entries were the only paintings that sold! If I recall, I made about $35 and was thrilled and felt a bit of vindication! Even today, after many exhibitions under my belt, I still get that knot of anticipation before a show. It is a mix of fear, excitement and eagerness. I know I am not alone in wondering if anyone will like my work. All artists wonder if anyone will anyone even look. Will something sell? Could a prize be won when the show has so many excellent works? When the show is juried, it is even more nerve wracking. The first hurdle is to be accepted into the show. Oh, the despair one feels if the work is not chosen. And no matter which works win the prizes, there is always criticism over the judge’s choices. While most artists are confirmed introverts, they are also very competitive. It is a crazy mix of contrasts and how we keep doing what we do. Today, I have also had the privilege of serving as a juror for numerous shows in the WNC region and Eastern TN. Having been on the other side of the situation as both an artist and a juror, it makes me very empathetic to the emotional roller coaster artists experience each and every time they enter a show and what a difficult job being a juror is. It is hard to reject work and harder still to pick the winners. Also the juror must consider if the work is properly prepared for display (wires, etc put on in a professional manner)? Is the presentation, things such as frame choices, fitting for the work? I once saw a very good small painting drowned in a huge fancy frame, and surrounded with a triple mat in Navy blue, red and white. The artwork was barely visible! And worst of all, if the judging is done by computer images, poor images immediately will eliminate work. Images that are blurry, not cropped or taken with a large house plant in the corner of the photo are the first to be eliminated. It is a cruel world, but this is usually the first step in eliminating work from consideration. Part 2 coming soon! Subscribe to get notices of new blog posts. Always purchase single pigments to save money and make your palette more versatile. If you get familiar with the coding on the paint tubes look for the color index codes. If you see more than one code, it is a mixture. The first two letters stand for the type of color (PR means Permanent Red) and the numerical code tells you the kind of pigment. Find a chart at your art supply store or online, most companies have charts for your reference. See picture below of what to look for. To make a very good visual black, mix ultramarine blue with cadmium red dark or maroon. If you do not have the dark version of cadmium, a medium will do. The opacity of the red, along with its orange bias creates a very strong visual black with good coverage. This is my favorite, it is easy and vibrant. The lightest colors on your palette are yellow and white. Since yellow is already so light, it is difficult to lighten it even more. The best way is to start with a clean brush and some white on your palette, slowly mix in just a tad of yellow at a time, until you get the color you want. If you mix white into yellow it takes too much paint to really lighten the yellow. If you decide to use yellow to paint florals over a background, make sure you use opaque pigments. Use cadmium or a yellow with plenty of titanium white added so you cover the background color. Transparent yellows can almost disappear over a vivid background. For that matter, always add the darker color to the lighter color, a little at a time. It takes much more light color to change a dark one and you could end up with way more paint than you need of a mixture. Save paint and time with this tip. Always add a bit of warm color to white for highlights such as light on glass or water. Use the warm colors that are on your palette (yellows and maybe a tiny touch of light red) to warm the white. You can make numerous types of browns, grays, and tans using red, yellow, blue and white. Decide what bias you want your final color to be. Do you want a blue gray, a red or orange brown, and light yellow/tan color? Then start with that primary color, or mix a secondary color using two pigments. Add a little of the third primary in small increments until your color is achieved. If you want a lighter version, add a little white, just a little at a time to get the value you want. Mix into the edge of your mixtures, not right in the middle. That way you can control the variation. A palette knife is good for mixing if you know what you are doing, and want a lot of a color. Otherwise, practice mixing with a brush, and take off excess paint before you mix, just try a little at a time. You can ALWAYS recreate a color. Trust your eyes to see the main ingredients in your desired color. This will tell you where to start. Practice is what you need to be able to really see color. If your brush contains white in the bristles, that white will get into your mixture, so be warned, you cannot get it out. Use clean brushes and plenty of them! Look at the VALUE (how light or dark it is compared to the other colors) of the colors on your palette to help you decide which colors to choose when mixing. If you want a dark color, go for the darker pigments. Sticking with a limited palette will produce a painting with color harmony. It is a sure thing! In our previous blog post we discussed following your instincts and getting to know the artists. Here are more tips on visiting galleries and talking to the artists. Is it OK to negotiate with the artist? The answer is absolutely yes, but only with respect for the artist and the work they do. It is never wrong to ask if discounts are given, but continued haggling can be very insulting. Until you take up painting or another artform, you cannot begin to image the time spent, not to mention the high cost of materials. You might offend if you use pressure tactics trying to get a lower price so broach this question carefully and respectfully. The answer will be either yes or no, and respect this. It is good to remember that art making is a business too, just like any other with lots of expenses, such as rent, advertising, bookkeeping and many other things, and all this goes into the price of the art work. Any artist who is professional will not do what some call “trading up”. This practice is for cars and manufactured items, not original works unless the piece you purchased has risen greatly in value based on auction history. So, know that sales are final when you make your choices. The art market has been flooded with reproductions in the past decade. Know when you are getting an original work or a work printed out on an inkjet type printer. Most commonly reproductions are called Giclee prints. The intrinsic value of these reproductions is very low, but it may be a way to get a facsimile of a work you like at an affordable price. Just know what you are getting. I always urge collectors to choose original art, even if this limits the size of work they can collect. If you have heard of Herb and Dorothy Vogel, you can see a lifetime of collecting small works and studies can result in an astonishing collection! But do not mistake an original print for a reproduction. A print is a handmade one of a kind artwork. Unfortunately this term has been misused causing confusion as to what you are getting. Please ask if something called a print is actually a reproduction or an original work. What if you find a piece that costs a tad more than you can spend? If you cannot put it on a credit card, ask if the artist or gallery does layaway. Many artists and galleries are happy to help you acquire the pieces you love with monthly payments. Be sure to make your payments on time as agreed upon! If you become a patron of a particular artist, you will often be given a discount for future purchases as a show of appreciation for your support and allowed to purchase additional pieces on a payment plan. If you wish to support to a favorite charity, support the artist also, by purchasing their work, and making a donation of art to the fundraiser. By doing this you support both the charity of your choice, and the artist who is creating a legacy for all of us. In future blog posts you will find tips for collectors, discussions on subjects about art and tips for emerging artists from professionals! Please subscribe to be notified of new articles. Fleta Monaghan is founder and director of 310 ART in the River Arts District of Asheville, NC. Original art is a wonderful way to adorn your home and work environment, reflect your personality, and create a safe and beautiful haven for yourself and others. Living with art is joyful and positive. Looking at art brings the beauty out of every soul. Make this year a time to create a positive and peaceful place. Now is the time to start! It can be daunting walking into a gallery or artist’s studio when confronted with so much to see… and deciding which artwork would be just right for you can seem difficult. Everyone has different tastes and you might not be sure how to begin. Here are a few simple tips that can help you to start and continue your collection. First, go look at a lot of art! You do not need to make quick decisions, but you can get a feel for the types of art you like and the colors and sizes that might work in your home and business. You do not need to match the sofa, and sometimes artwork is the starting place for an interior design theme or makeover. When possible, meet the artist. This will give you some insight into the art, and perhaps you will find deeper meaning too or have your feelings confirmed about the piece that moves you. Visit artist’s studios and receptions where you can see new art and ask questions about the work. These are festive occasions and a fun way to spend an afternoon or evening. Ask the artists for their resumes and web addresses and look them up. You can tell quickly if an artist has been working as a lifelong artist and experience is one verification that your instincts are right. Sometimes you may meet a very promising emerging artist. Purchasing work from young or emerging artist of any age will help them move ahead with you as their partner and collaborator. There is no right or wrong when you choose art you love. Often you will be instantly captivated by a painting, sculpture or piece of fine craft work. Usually your first instinct is the right one. You will be drawn to the emotion a work conveys or it might be a reminder of a place or time that is precious in your memory. But make sure the art is well made, and the artist knows their materials so the work will last for generations. Look over the surface of paintings carefully, make sure sculpture is stable and weighted so it does not tip over. For large works, make sure the wiring is sound and installation is easy and safe. Sometimes the artists can install a work for you, but usually a professional art installer is required if you have a tricky wall such as brick, or a particularly heavy piece. Safety first! Ask the artist or gallery representative who is the best to install the work if you feel you cannot do it yourself. When buying art, make sure to check the back side or reverse of the piece. An art piece should look good front, back, and side. Crooked corners, thin canvas, wobbly frames all impact the durability of the piece. Ask the artist about the materials her/she uses....are they archival (durable), stable, permanent? These are important factors when considering buying any original artwork. Any reputable gallery or experienced artist should be able to answers the questions you might have. Figure out ahead of time how much you wish to spend, and shop with intelligence. Compare pricing in your area too. Generally lifelong artists with years of experience command higher prices, but not always. If you find an artist you like, talk to them about the types of work they do, the size you wish to acquire, what your budget is and let them help you find the right piece. Most artists have much more art than what is on display. You may find that there is just the right piece in the artist’s collection and not currently on display. Galleries should be able to help with this too.